While no one can argue the benefits of technology, it doesn’t help families build strong relationships. There are so many benefits to playing family games, but in this article, I’d like to focus on the 4 top benefits of board games. In the age of technology, good old fashioned board games can prove to be a welcome change of pace that brings the whole family together. Some of my favorite childhood memories are playing board games on Friday nights with the whole family and playing games at the kitchen table with my cousins on rainy days. As my son gets older, I can’t wait to introduce my favorite classic board games to him. He gets so excited when I remind him that it’s family game night, which we try to have every week, like I did growing up. If you’re hoping to create some significant and deep childhood memories for your kids, the quiet and low-tech board games are a perfect fit. 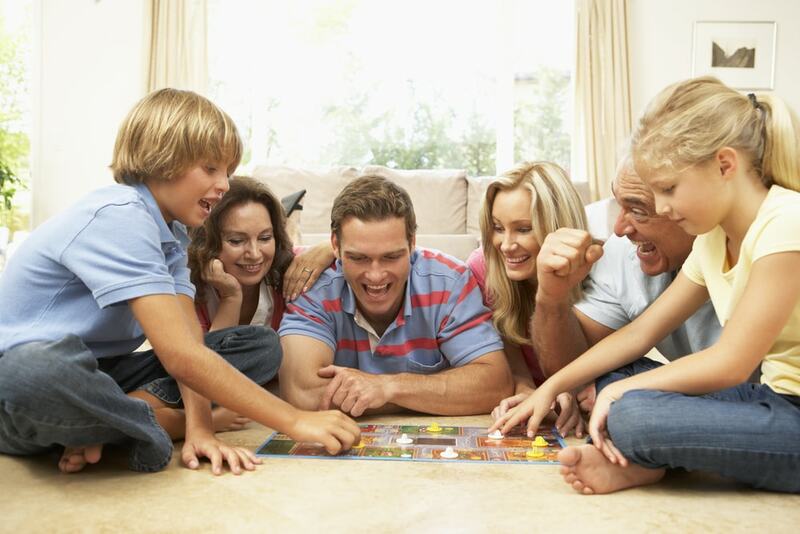 Consider playing board games as a family, it will be a fun night that benefits the entire family. Board games are not only fun for kids, but they are excellent learning tools as well. Playing a game from start to finish helps children develop their concentration skills, which are essential for completing daily tasks and doing well in school. My son is learning to follow the rules of each game and this is helping him understand the importance of rules in real life as well. Increasing problem solving skills is another great benefit to board games. Setting up and moving all of those game pieces, rolling dice, and shuffling cards help little children and even older ones develop their fine motor skills and hand-eye coordination. Board games can also help improve language, memory, and imagination. Board games are one way to help children learn cause and effect. They understand each time they take a turn it will have an outcome on the overall game. Kids also learn to interact with others in appropriate ways. My son has had a few meltdowns while playing board games, but is learning how to be a gracious winner and loser. If a young child loses control of their emotions while playing, after they calm down is the perfect time to talk to them about their feelings of sadness, anger, or frustration. The time spent talking about emotions is beneficial for children to develop their emotional and social skills. Children learn how to be a good sport, how to congratulate others, and how to play fair. My own home too often becomes screen time territory. I use board games to have quality family time. Even though family members are playing against each other, board games really bring families together. If a fight breaks out between siblings or other family members, it’s a great opportunity for everyone to talk to each other, increasing positive family communication and working together through problems. Instead of silence as each person is absorbed in their electronic device, the room is filled with conversation, laughter, and love. Whether board games are used sparingly, when it’s too cold or rainy to go outside, or whether a special day of the week is set up for game night, consider playing board games as a family. It will be a fun night that benefits the entire family.